Barcelona face a crunch clash with Atletico Madrid on November 24 right after the international break, and they could receive positive injury news on Philippe Coutinho. The Catalan giants suffered a disappointing 4-3 defeat at home to Real Betis last weekend, and so they’ll spend the break smarting over that loss and itching to respond in a positive manner. While their defensive flaws were exposed in that encounter, they were missing a key attacking piece too with Coutinho out due to injury having picked up a problem against Inter in the Champions League, which was expected to keep him out for up to three weeks. However, with the benefit of the international break to stay behind at the club’s training ground and continue his rehabilitation and to receive treatment, it appears as though the La Liga champions could be set for a major boost against Diego Simeone’s men. According to Mundo Deportivo, there is hope that the Brazilian playmaker will recover in time to feature in the Spanish capital later this month, in what promises to be a crucial clash between the two giants. Barcelona sit just one point clear at the top of the table after 12 games, and another defeat after their loss to Betis would certainly raise question marks over their title credentials and give their rivals hope of dethroning them. 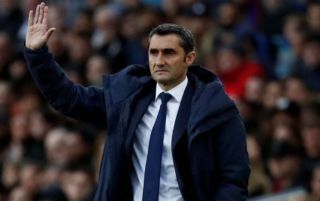 With that in mind, coach Ernesto Valverde will want as close to a fully-fit squad at his disposal as possible, and so suggestions that Coutinho could be fit to feature will be music to his ears having seen Lionel Messi return from his own injury setback this past weekend too.